The process is rather simple: users register their identities via uPort’s mobile application and obtain a unique public address linked to an Executable Distributed Code Contract (EDCC) – which is an electronic agreement that works on the Ethereum blockchain – or, simply put, uPort Proxy Contract. 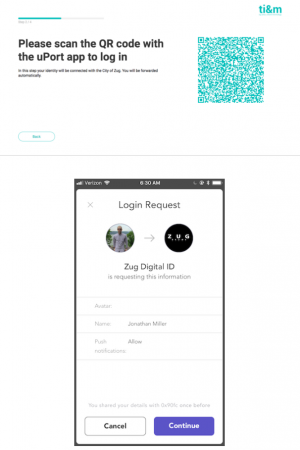 Once the code is registered, a QR scan allows the user to sign into the Zug ID web portal. I won’t plunge into educational details as I hope that enough time has passed even for the general audience to realize that the blockchain drastically differs from cryptocurrencies – it is a technology in the first place, not the product of technology – and has a lot more to offer than financial bubbles. So let’s go on with our story. On November 20, 2018, a bike sharing service AirBie (funny name considering the similarity with a famous accommodation-sharing service) that uses uPort, launched the first-ever e-bike service powered by a decentralized identity. Originally, AirBie was founded in by Philipp Zollinger and Christian Raemy who came up with the idea of enabling the Internet of Things (IoT) via the technology of blockchain. The process follows these three steps below. Step 1: first of all, you have to download the dedicated AirBie application. To log in, users visit uPort to share the credential “Digitalid” attested by the city’s administration. Step 2: once the verification is complete, a Zug resident logs to find the nearest bike on the map to use it for a commute. Step 3: upon arriving at a place, the user parks the bike and locks it using the app to end the journey. This way, the residents of Zug are among the first ones to benefit from the variety of tangible blockchain benefits. I mean, little by little, but the technology is taking steps towards a real (okay – not digitalized) life, and now it supports everyday mobility needs of users. Seems like it’s a great time to be an inhabitant of Zug now: they are all provided with a free access to AirBie Cryptobikes up to 20 hours. However, if you happen to visit the city as a non-resident, you don’t currently have an access to the service. Undoubtedly, the launch of AirBie is a significant milestone for the urban mobility and the concept of smart cities which, in the future, will be built based on privacy rights and identity control of its citizens.